Reading dog food company claims on some food packaging, one might assume that the food is highly superior to everything else on the market. Superfood, Natural, Real Chicken, Farm Raised Fruit. However, what do those claims actually mean? 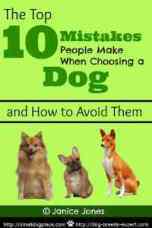 Not much, according to Linda Case the author of Dog Food Logic. 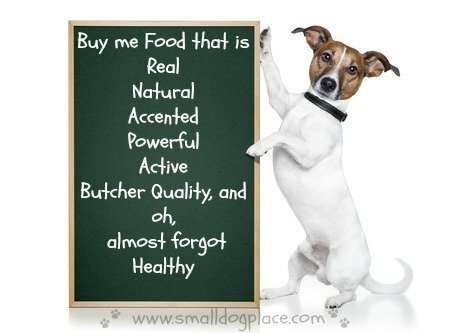 I often wonder how much dog food companies pay their advertising staff to come up with such fantastic descriptions and unique wording to make their food sound like it is out of this world. you’ll see that most are meaningless and some even silly. Butcher quality chicken: What does that even mean? I never realized that butchers had a rating scale. Healthy fruits: versus unhealthy fruits. I thought that all fruits were healthy. Silly me. Active ingredients versus inactive ingredients? Active ingredients sound like something in an over the counter medication. And, here I thought they were talking about dog food. Real Lamb versus fake lamb? So who would have guessed there was such a thing as a fake lamb? Which scientist thought up that one? Protein focused versus protein unfocused? Does that mean the protein needs glasses? Maybe they should put that protein on ADHD medication? Powerful antioxidants versus powerless antioxidants. 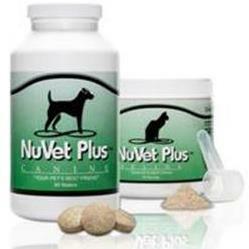 Poor pitiful powerless antioxidants—you sure don’t want those in your dog’s food. Accented with vitamin rich vegetables: How exactly do you accent a vegetable? Life Protection Formula: Glad to know my dog food will protect my dog for life. Protect him from what? Companies go to great lengths to sell their products. Sometimes the taglines are memorable but sometimes they come across as nonsensical. Dog food companies, to be sure, have plenty of competition even within a large marketplace. These claims are meaningless and have no value other than to convince consumers to purchase products. Adding hype to their label is one way to grab the dog owner’s attention. Don’t fall victim to such claims. They mean nothing. Better to spend time reading the dog food label, the guaranteed analysis or the AAFCO statement and learning about canine nutrition than to put any stock into gimmicky statements. Dog Food Logic is the indispensable guide to the science behind canine nutrition that will help us to make wise, well-informed choices about how and what we feed our dogs. I have personally read it twice now and refer to specific sections frequently. I highly recommend it.